It sounds like the baby has PMV... the neurological symptoms you described could have another two possible causes, but there has been a terrible outbreak of PMV in Australia for the last few months, so much so the government had to put a ban on birds being raced or transported, to try to contain the disease. The prognostic for your little patient is not very optimistic, I'm afraid, as babies that are hand raised didn't get antibodies from the parents and are more vulnerable... and PMV is a very debilitating disease, which can be fatal. There is no medication that will help, as it is a virus, so the best defense is to make sure the baby is eating and drinking enough, and if possible provide a multivitamin supplement, or at least a calcium supplement with vitamin D3 (it has to be D3, not just D, and if it's specifically for birds, all the better). There may be secondary infections, and if so a vet may prescribe an antibiotic to combat them, as birds with PMV have a very depressed immune system and find it hard to cope with infections. If the baby also has canker (trichomoniasis) he will need to be treated for that too. But otherwise, PMV cannot be cured with medications, and must be allowed to run its course, approximately 6 weeks. During this time he must not come into contact with any other birds, or he will infect them too. Your hands and clothes can also transmit the virus to any other bird you come into contact with after handling the baby, so please be careful. The disease is not transmissable to humans or 4-legged pets. You may have to hand feed the baby if he's not capable of eating (or of eating enough) on his own. Do you know how to do this? Please keep us posted, and good luck! I've been caring for three pigeons with PMV over the past months and I agree that the symptoms you describe sound just like that. I'm in Melbourne and we're hearing stories of this constantly and it has even wiped out several populations of free pigeons. Whilst the virus has a life of about 6 weeks, the head twisting symptoms can last long beyond that. My experience has been 4-6 months of care required before the bird comes good. Two of mine are fully recovered. One is not showing much progress and she's entering her 5th month soon. 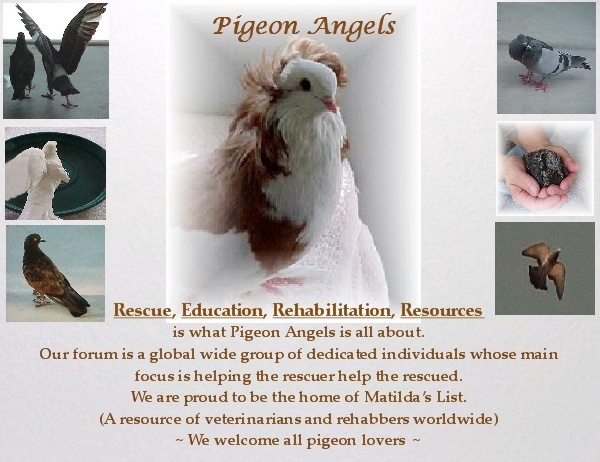 At the worst stages of the virus hand feeding or crop feeding is essential and I also think that a hot water bottle or heat pad at night is really important as the pigeon can't regulate his/her temperature very well. Most vets in Australia will just say to euthanase the bird so make sure to go to a vet that you trust and is a specialist with birds. They can make it through but I admit the odds are not as strong as I'd like them to be.